"script" elements are inline elements. "script" elements are also block elements. 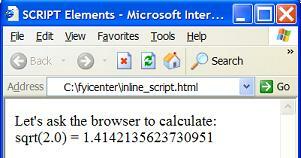 Most browsers will executed contents of "script" elements as script code. What Are Commonly Used Inline Elements? What Is a "strong" Tag/Element? What Is an "em" Tag/Element? What Is an "code" Tag/Element? What Are "sub" and "sup" Tags/Elements? What Are "del" and "ins" Tags/Elements? What Are "big" and "small" Tags/Elements? What Is a "br" Tag/Element? What Are Other Inline Elements?